keeping our jobs clean, organized, on-time, and on budget. 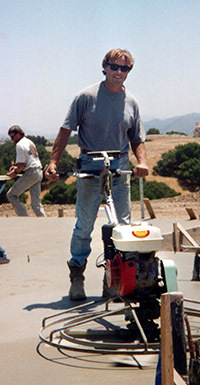 Dan Hemming Concrete has been providing superior concrete services since 1976 for commercial and residential clients of Santa Barbara, Santa Ynez, Lompoc and surrounding areas. Because we are locally owned and operated we believe in a hands-on approach, providing the highest quality workmanship at competitive prices. We treat our clients with the utmost respect, keeping our jobs clean, organized, on-time, and on budget. We are fully insured, licensed (CA Lic# 326566) and bonded, so you can rest assured that you’re in good hands. We are proud of our jobs and stand behind the services we offer. Our jobs are backed with our workmanship warranty. We will gladly provide a list of references to help make your decision an easier one. Give us a call, we’d love to hear from you.